User Interface Design and Evaluation provides an overview of the user-centered design field. It illustrates the benefits of a user-centered approach to the design of software, computer systems, and websites. 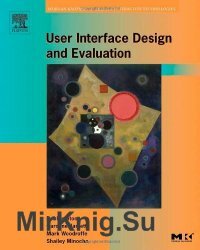 The book provides clear and practical discussions of requirements gathering, developing interaction design from user requirements, and user interface evaluation. The book's coverage includes established HCI topics—for example, visibility, affordance, feedback, metaphors, mental models, and the like—combined with practical guidelines for contemporary designs and current trends, which makes for a winning combination. It provides a clear presentation of ideas, illustrations of concepts, using real-world applications. This book will help readers develop all the skills necessary for iterative user-centered design, and provides a firm foundation for user interface design and evaluation on which to build. It is ideal for seasoned professionals in user interface design and usability engineering (looking for new tools with which to expand their knowledge); new people who enter the HCI field with no prior educational experience; and software developers, web application developers, and information appliance designers who need to know more about interaction design and evaluation. Co-published by the Open University, UK. Covers the design of graphical user interfaces, web sites, and interfaces for embedded systems. Full color production, with activities, projects, hundreds of illustrations, and industrial applications.